We love food. One of the wonderful things about travel is not just seeing new places and meeting new people, but trying new foods. Different spices and cooking techniques make all manner of dishes taste completely different even within the same towns we visit, but nature’s bounty is what has us mesmerized and constantly titillating our taste buds with its cornucopia of fruits. As we head closer to the tropics this bounty is apparent and fresh. We have not even left Mexico at this point and even though we are both seasoned travelers we have encountered new fruits. We will try to catalog a few here on the website. Some of you may know a few but not all of you will know all of these fruits… please enjoy. First we will post our most amazing discovery. A fruit very similar to the revered and stinky South East Asian fruit: Durian. This fruit is called Yacca by the locals in the coast of the State of Nayarit (have not found a more scientific or generic name). It is a very large fruit of irregular shape, I would guess that a good sized Yacca could way more than 10 pounds. The outside skin -unlike the Durian- is not spiky but it does have segmented dimples of sorts. 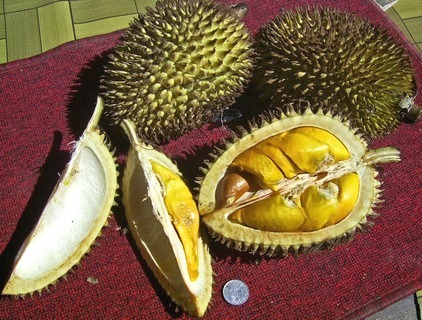 In order to minimize my destruction of the english language via my description I have poached a picture from wikipedia (of a Durian)… the inside of the Yacca is very similar. Photo of a Durian NOT a Yacca. Courtesy of Wikipedia.org The inside structure of both fruits is very similar. Describing the fruits flavor will be near impossible for someone of my near nil literary caliber. My best shot at it would be to call in an ice cream flavor: Tutti Frutti. Tutti frutti literary means all fruits in Italian, granted the ice cream tastes very synthetic… but this fruit really does taste like an amalgamation of fruit flavors. If you take a bit and close your eyes there will be hints of mango and apricot, or is it honeydew melon and strawberries? You decide, if you ever see this fruit please do your taste buds a flavor and try it! The following entry is still of impressive size, but relatively disappointing flavor. It is known as Cidra and it looks like a lemon on steroids. The lemon on steroids of the citrus world: Cidra. Notice the diminutive lime next to it. We found this behemoth of a citrus near the town of Patzcuaro. I asked a local what it was and if it was good, he did not answer and proceeded to climb the tree cut one down and said: “It is good, sweet and 20 pesos please.” We paid for our fruit (even though the guy obviously did not own the tree, he just happened to be walking by). I cut into it and noticed a very large amount of pith. I removed as much pith as possible and wound up with a fruit very similar in size to a grapefruit. The flavor was very disappointing, because there really was no flavor to speak of. I cannot blame the fruit because it may have been picked before its prime, so the verdict is out for the time being. The following fruit I (Luis) am quite familiar with and I happen to like it and other members of its Passion Fruit or Passiflora family. In Mexico they call this fruit Granada China and it is not the same as the commonly known Passion Fruit. Passion fruit is very tart and sweet, this fruit is just sweet no tartness here. It has a thick and relatively plasticky feeling outer shell and inside is a sac full of seeds which are themselves surrounded by a small bag of slimy juice. You cannot really bite down on the seeds just swirl in your mouth and take in all the flavors of the juice. Very good fruit, but a caveat is necessary for those of you with an adversity to slimy textures. Granada China or Parcha. It is more oblong than the more popular Passion Fruit. The pic on the right is a small individual seed in its juice bag housing. Last but not least in this post is the Mamey Zapote (pouteria sapote). The brown outer layer has a texture somewhere between sandpaper and the bark of a tree. We have seen it made into milkshakes at street fruit bars. The fruit’s flavor is variously described as a combination of pumpkin, cooked sweet potato and the texture is smooth creamy and sweet. I cannot say this is my favorite fruit, but I may try it in a milkshake which may be a good vehicle for its flavors. Mmmm, chico zapote, I have a tree in San Miguel that should begin producing that in 5 or 6 more years, cant wait. Keep up the food narration! Love food so much I can almost taste what you post… Thanks! Envy you guys and your experiences! Glad you r enjoying it! Look forward to seeing you some day after you’re done. Keep it coming! Alguien me podria decir donde encontrar DURIAN en Mexico porfavor? Durian no vimos, pero si esta fruta muy parecida pero sin el olor particular del durian es muy sabrosa… en la costa entre Mazatlan y Puerto Vallarta se consigue la yacca. Divina! that “yacca” fruit is a jackfruit.